The TÜRKÖK database can match two out of three patients with suitable donors successfully. Authorities aim to raise the number of donors to 500,000 by the end of this year. As Turkey strives to keep everything "national and local" in its campaign to cut off dependence abroad for goods and services, a health project has contributed remarkable changes in the country's fortunes. Thanks to Turkey's Stem Cell Coordination Center (TÜRKÖK), the country now supplies stem cells to 11 countries, establishing itself as a brand in the field in the international community. From Germany, Italy, the United States and India to Slovenia, Belgium and France, the stem cell coordination center jointly formed by the Health Ministry and Turkish Red Crescent in 2014 reached out to countries in need of stem cell donations. 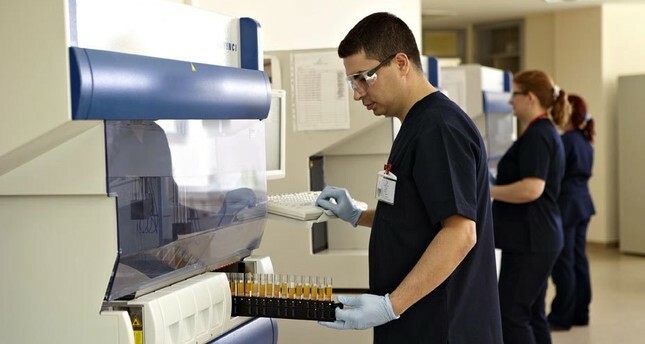 Professor Fevzi Altuntaş, head of the World Apheresis Agency (WAA), which focuses on medical technology for blood transplants, says that apart from health benefits, Turkey significantly cut costs in terms of patients in need of stem cells that cost some 35,000 euros ($39,580) if imported. "TÜRKÖK raised the bar in terms of the health sector in Turkey and reached 350,000 registered donors in a short time. There were 4,600 stem cell transplants last year and the rate of donors is far ahead of donations in other countries," Altuntaş said. He urged more people to donate stem cells, alleviating unfounded concerns that it would involve a complicated surgery. "This is a simple procedure involving collecting blood from the arm," he says. The stem cell database of TÜRKÖK shortens time for those awaiting bone marrow transplants. The database, set up in 2015 to coordinate donations and transplants, is in compliance with international standards as member of Bone Marrow Donors Worldwide and the World Marrow Donor Association. It was little known when it was first launched and reached out to only 28 people that year before the number of transplants rose to hundreds in a few years. Currently, the database can match two out of three patients with suitable donors successfully. Authorities aim to raise the number of donors to 500,000 by the end of this year. Speaking at a meeting with stem cell donors last week, Health Minister Fahrettin Koca said Turkey was the fourth country in Europe with the highest number of bone marrow transplants and more donations would allow them to reach out to more people in need. Stem cell transplants are primarily used for patients suffering from leukemia, lymphoma and myeloma. After accrediting with bone marrow banks around the world, Turkey started offering access to the database to people abroad. Before the database was set up, patients had to find their matches on their own in international bone marrow banks. Likewise, Turkish donors can now save the life of patients abroad thanks to TÜRKÖK's integration with other databases around the world. Turkey pursues what the authorities call a "domestic and national initiative" to reduce its dependence on imports and to promote local projects more in everything from the defense industry to the automotive sector. A new biotechnological drug entirely produced in Turkey and will be used in treatment of head and neck cancers, was introduced to the public in November, with authorities saying that a trial phase will be launched soon. Another locally-made cancer drug, developed by a team of scientists at Boğaziçi University, is counting down to clinical trials.